How Does a School Librarian Get Books Returned? Promise Them Anything! My great pal, Alanna Moss, does it again. Readers might recall that one year Alanna got duct-taped to the wall. A hard one to top, admittedly. This year, Alanna went with a classic, administered with a mix of caution and zeal by the school principal. Anything to get those books returned! 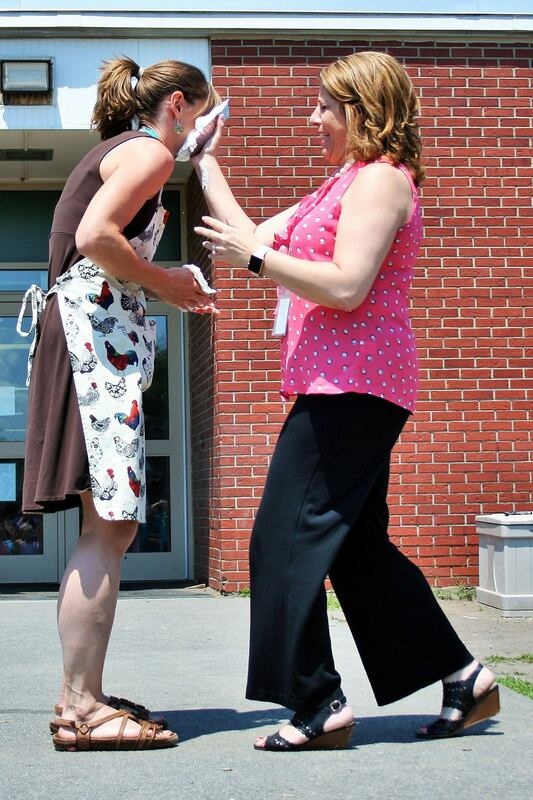 Ichabod Crane Primary School is lucky to have Alanna. 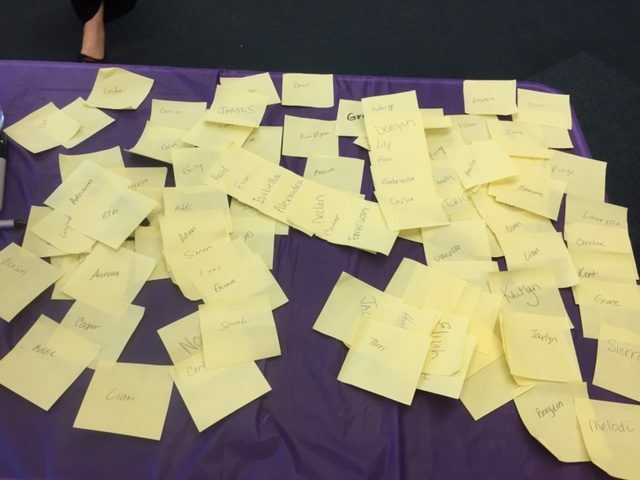 It leaves me wondering, once again, how it can be possible that any school in NY doesn’t have at least one full-time librarian? 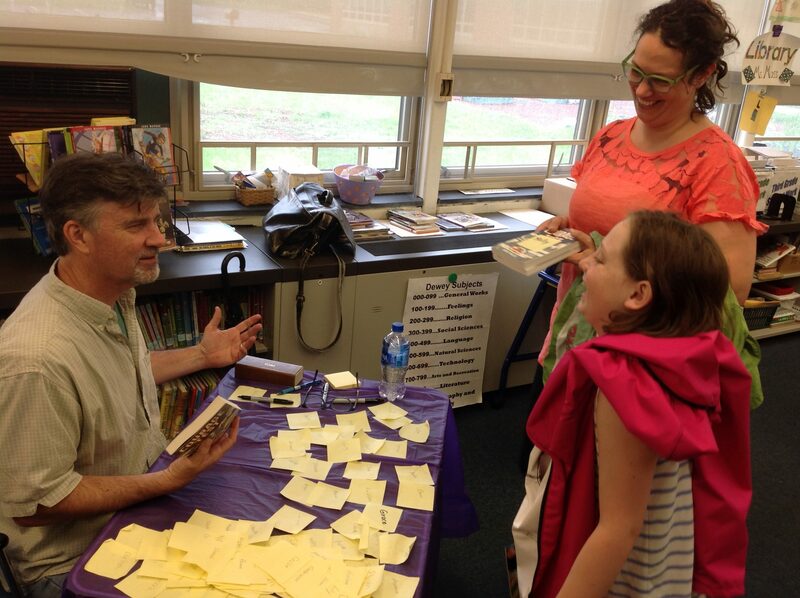 I had a happy experience on a recent evening at Ichabod Crane Primary School in Valatie, NY. 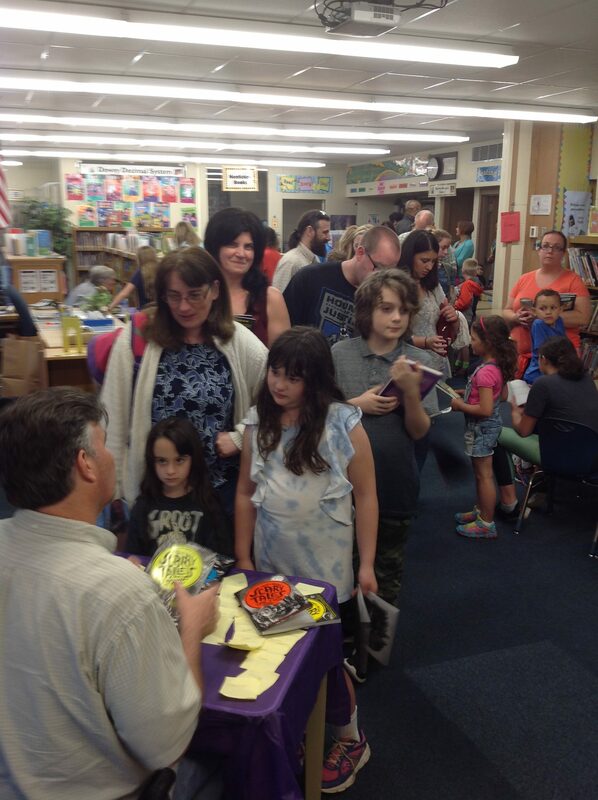 I was one of two authors invited to an annual event at the school: Young Authors Night. 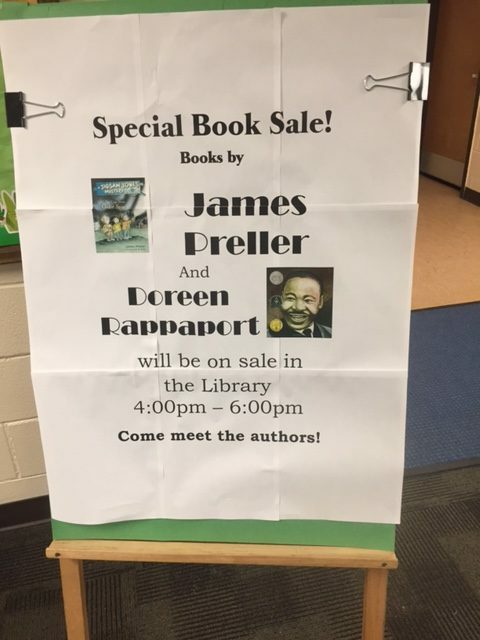 The other invited guest was the brilliant Doreen Rappaport, who writes widely-acclaimed picture-book biographies. I’d met Doreen before and she’s simply the best; her work is second to none. We were asked to come from 4:00 – 6:00 to sign books. That’s it, just sit and sign. However, no payment — but we were assured that the Ichabod Crane community comes out strong for this event. Inside the library, I was offered a chair, a desk, and a pen. Same deal for Doreen, across the room. Doreen and I chatted a bit, traded war stories, while the librarian, Alanna Moss, gracefully attended to last-minute details. 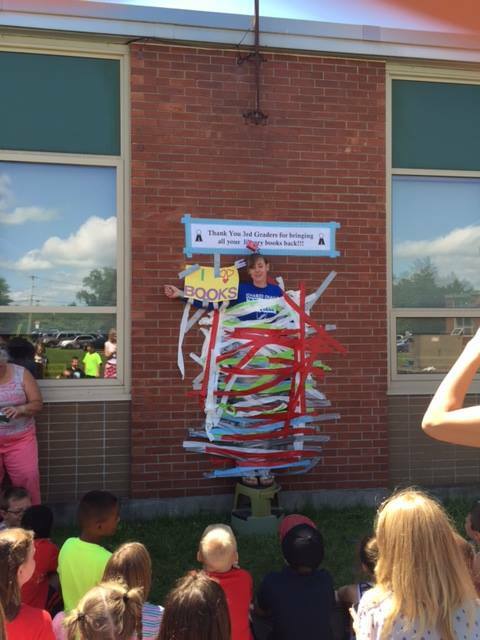 Frequent readers of James Preller Dot Com may recognize “Miss Moss,” for she’s the librarian who hilariously had herself duct-taped to a wall to motivate end-of-year book returns. At almost 4:00, we took our places. “They’ll start coming in soon,” Alanna informed us. I hope so, I thought. Oh, and one other key detail: The school has been hosting this event for many years, always on the day of the school budget vote. Smart, right? It helps get parents out of the house, they visit the school, support literacy, vote “yes” for the budget, all before dinner. Genius. And an idea worth stealing! I signed books nonstop for two hours. Same with Doreen. No question that a huge part of the night’s success can be attributed to the aforementioned Miss Moss, who did so much advance work prepping the students. 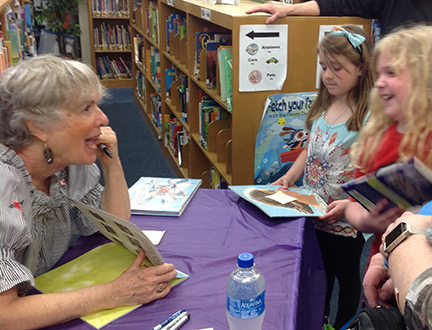 She shared our books in the library, building anticipation and excitement for the “big night,” inspiring young readers to come on out and get their books signed by real (and evidently still live) authors. 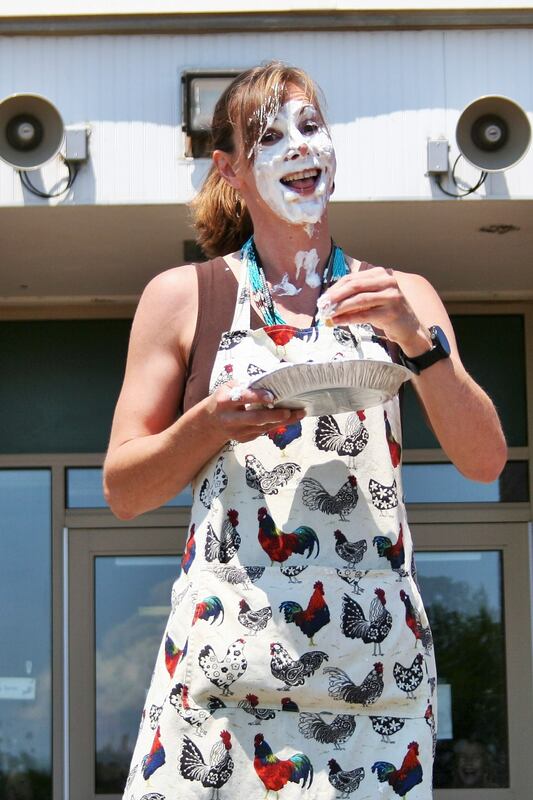 This is just to say: Thank you, good folks at Ichabod Crane Primary School for letting me share a slice of this special night. It was impressive all the way around, particularly the way the families came out for their children — to support literacy, to vote, to have some family fun. A true community of readers. Well done!